“He is just a dreamer”, we say ! And we dismiss dreams as a wasteful pastime (or is it time-pass?) – as if it somehow takes away from the serious business of life, our hold on what we see as “reality” or “practicality”. We scoff at our “flights of fancy”, and give up the chance to try out the wings they offer. And so, we lose hold on one of the greatest powers bestowed on us – our window to the future, our chance to fulfill our deepest thoughts. Dreaming is not easy. It enjoins us to let go of the known, the controlled…to enter the heady realm of unconstrained thought, wishes let loose. Dreaming feels scary. Dreaming feels dangerous ! Here’s to dreaming more. And having faith in our dreams. Until one day they work out — turn from the impossible into the inevitable. And then it will be time… to dream again ! This entry was posted in Uncategorized and tagged belief, conviction, dreams, inspiration. Bookmark the permalink. Nice one Madhuri. 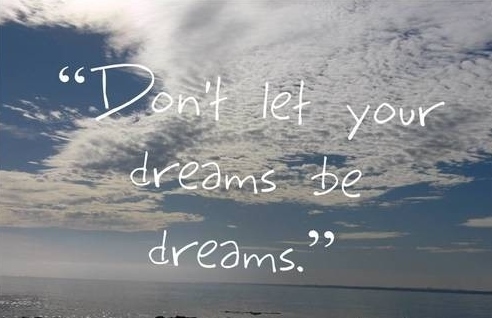 Richard Bach said – You are never given a dream without also being given the power to make it true. You may have to work for it, however.